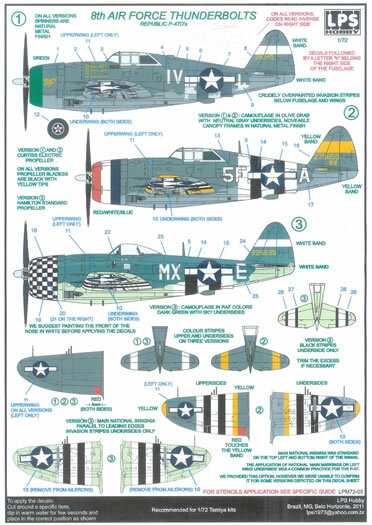 3 subjects per set, water-slide decals, coloured painting and markings guide, plus stencil placement guide with the USAAF sets. Excellent decal quality and attractive subject choices. Insufficient national insignia and stencils for all three schemes per set. 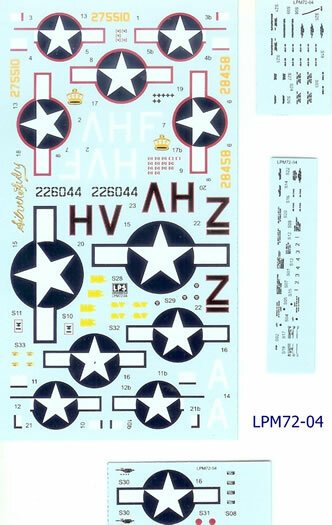 I feel that the price envelope is being pushed fairly hard when compared to several other decal brands with more attractive instructions and larger decal sheets. Excellent production quality for the decals, good if slightly bland instructions. I feel these sets are expensive given that only three schemes are offered in each case, with insufficient national insignia & stencils to complete all options the set provides individual markings for. 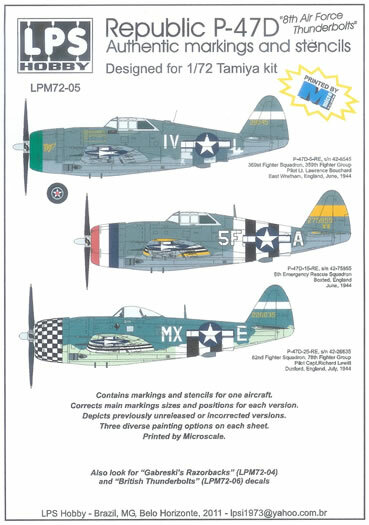 The Republic P-47 Thunderbolt is a true classic and a justifiably popular modelling subject; so some new decal sheets covering of schemes are sure to be welcomed by many. In this respect LPS Hobby’s latest three releases are right on target in my opinion with the selection of schemes reviewed below. Each set of decals comes in a zip-lock plastic bag. An A-5 sized header is printed in colour, as are the painting and decaling guides. These are I think ink-jet printed on rather thin paper. They have a matt finish, with some colours looking a bit faded, and in some cases possibly a bit off-hue. 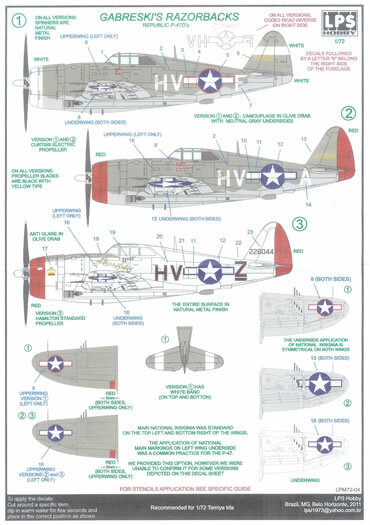 To be fair, it is not necessary for the guides to have exactly the right colours illustrated, and the instructions do mention in the case of the RAF P-47s that photos suggest the aircraft were rather faded. 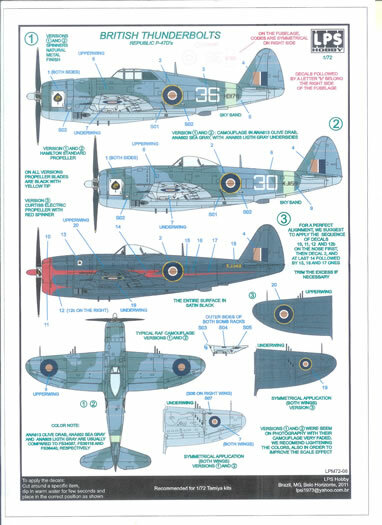 Colour call-outs refer to FS-595 and ANA codes as well in the case of the British sheet. 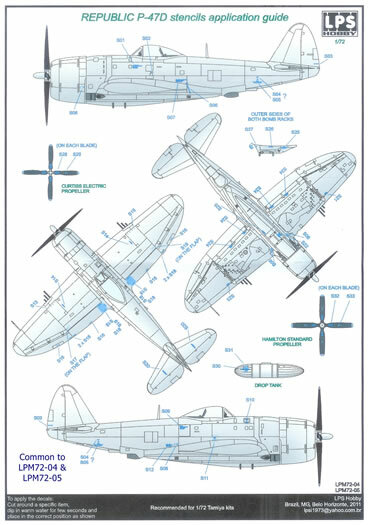 They are replete with useful notes on markings, propeller type fitted, spinner colour etc, as well as stencil plans for the USAAF aircraft. So whilst my first impression of the instructions was a little negative I must confess the more I studied them the more I came to appreciate their clear layout and thoroughness. They are in fact more than adequate for their intended purpose; they just a lack a little of the quality feel associated with the glossy colour guides some other decal brands use. The decals are printed by Microscale and appear to be of excellent quality, with superb registration and what looks like good opacity. 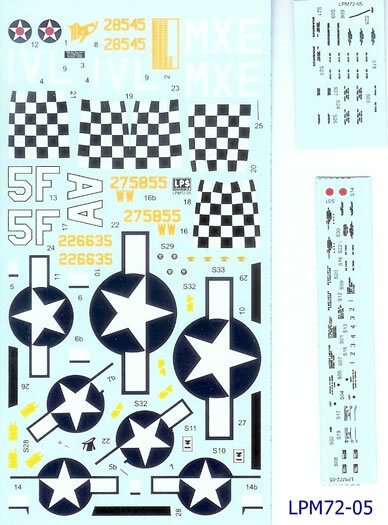 The sheets advise in each case that the sets are designed for use with the Tamiya kits (which are undoubtedly the best P-47D’s in 1/72-scale). The relevance of this I think is mainly in regard to the checkers and red band decals intended to surround the engine cowl, as all other decals should be unaffected by the brand of kit selected. Three subjects per sheet are fine as such, but the sheets are fairly small and lack sufficient national insignia and stencils to complete all three options. 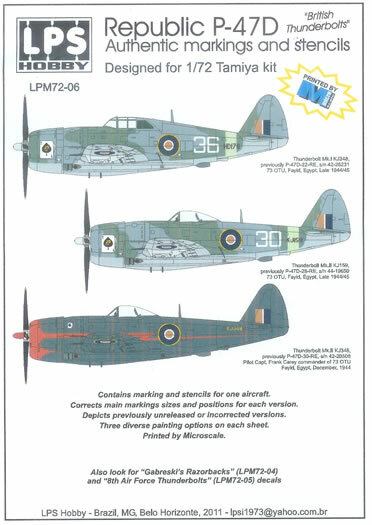 I don’t often address price, but I feel that these sets are a rather expensive compared to brands with equivalent quality decals using the same size packaging, but offering either more subject choices and/or complete markings sets for each subject. I’d still buy them because of the subject choices, but for the money I’d like to be able to complete each subject without resorting to other decals sources for national insignia and stencils. P-47D-5-RE, s/n 42-8458, 61st Fighter Squadron, 56th Fighter Group, Halesworth, England, November 1943. P-47D-11-RE, s/n 42-75510, 61st Fighter Squadron, 56th Fighter Group, Halesworth, England, December 1943. P-47D-5-RE, s/n 42-8545, 369st Fighter Squadron, 359th Fighter Group, Pilot Lt. Lawrence Bouchard, East Wretham, England, June 1944. P-47D-15-RE, s/n 42-75855 5th Emergency Rescue Squadron Boxted, England, June 1944. P-47D-25-RE, s/n 42-26635 82nd Fighter Squadron, 78th Fighter Group Pilot Capt. Richard Lewitt Duxford, England, July 1944. Thunderbolt Mk. I KJ348 previously P-47D-22-RE, s/n 42-26231, 73 OTU, Fayid, Egypt, Late 1944/45. Thunderbolt Mk. II KJ159 previously P-47D-28-RE, s/n 44-19650, 73 OTU, Fayid, Egypt, Late 1944/45. Thunderbolt Mk. II KJ348 previously P-47D-30-RE, s/n 42-20508, Pilot Capt. Frank Carey commander of 73 OTU. Fayid, Egypt, December 1944. The quality of the decals in these sets appears to be excellent, and that obviously counts for a lot. The subject choices are also interesting and attractive, and for many will seal the deal when it comes to ordering. However the sets are in my view a bit expensive compared to similar sized packages from other producers, and would offer more justifiable value if full sets of national insignia and stencils were included for each option. 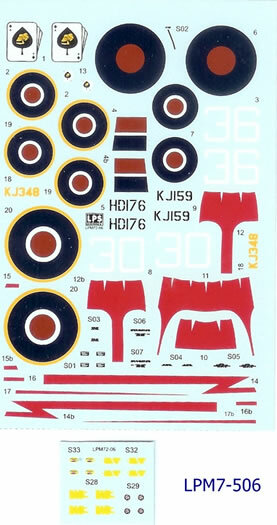 Despite my concerns regarding value, the subjects and the decal quality would still tempt me to buy these sets. I’m happy to recommend them as value perception can vary widely amongst different people. 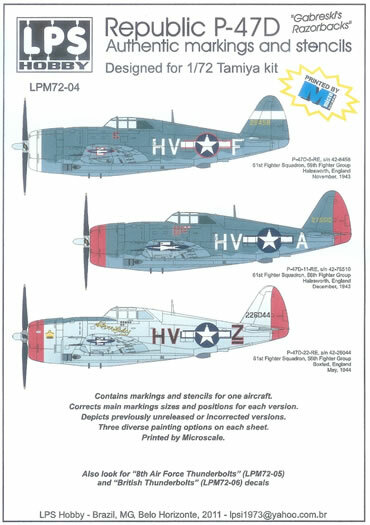 Thanks to LPS Hobby I now need to buy some more Tamiya P-47’s!